Enne Salta arrives to the City of Sin, a respectable and proper young lady, but that is not how she will leave. As Enne searches for her mother, she discovers secrets about her past which will change the very foundation ofwho she may become. This book is for anyone who craves mystery, romance, and magic all wrapped into one unforgettable package. 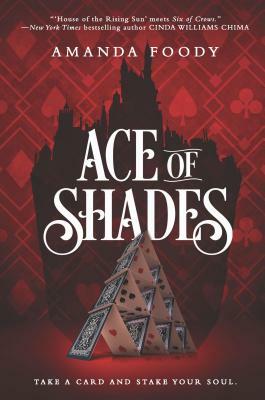 Ace of Shades is sure to have you up until the break of dawn attempting to solve the intriguing puzzles it has to offer. Welcome to the City of Sin, where casino families reign, gangs infest the streets...and secrets hide in every shadowEnne Salta was raised as a proper young lady, and no lady would willingly visit New Reynes, the so-called City of Sin. But when her mother goes missing, Enne must leave her finishing school--and her reputation--behind to follow her mother's trail to the city where no one survives uncorrupted.Frightened and alone, Enne has only one lead: the name Levi Glaisyer. Unfortunately, Levi is not the gentleman she expected--he's a street lord and con man. Levi is also only one payment away from cleaning up a rapidly unraveling investment scam, so he doesn't have time to investigate a woman leading a dangerous double life. Enne's offer of compensation, however, could be the solution to all his problems. Their search for clues leads them through glamorous casinos, illicit cabarets and into the clutches of a ruthless Mafia donna. As Enne unearths an impossible secret about her past, Levi's enemies catch up to them, ensnaring him in a vicious execution game where the players always lose. To save him, Enne will need to surrender herself to the city...And she'll need to play.